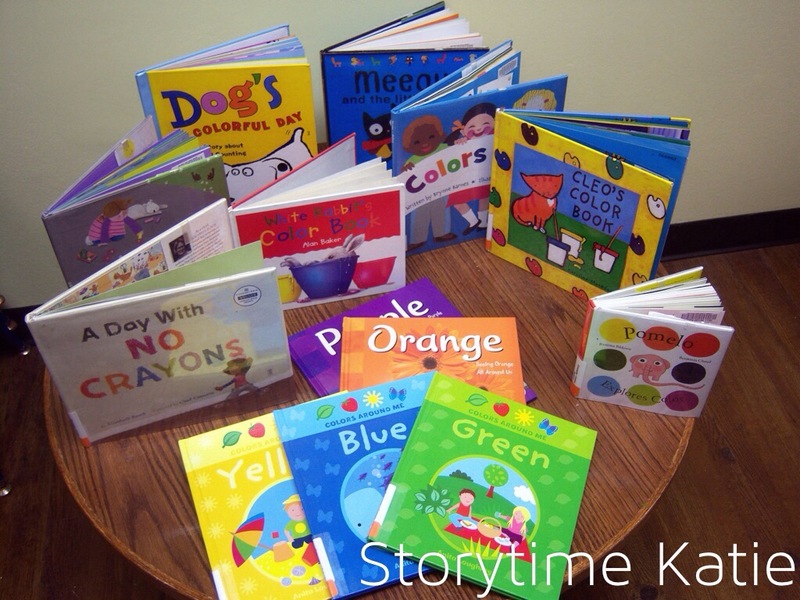 In response to the STEAM movement (and with great thanks to such great inspiration & encouragement from colleagues: Amy, Abby, and Kendra), this past fall I started a STEAM storytime series at the library. This is primarily aimed at preschoolers and their families, registration open to ages 3-7 in our library. I think the most successful book for this day was “The First Day of Winter” — the kids were very into the cumulative nature of the book and it definitely held their attention. I brought snow in from outside. I put it in giant plastic bins (that normally housed our cushions for storytime) and let the kids paint with watercolors in the snow. This station BLEW their minds. I don’t think that any of the kids had ever thought that it was possible to paint with snow. I heard a lot of good conversations as to why the snow worked like water. 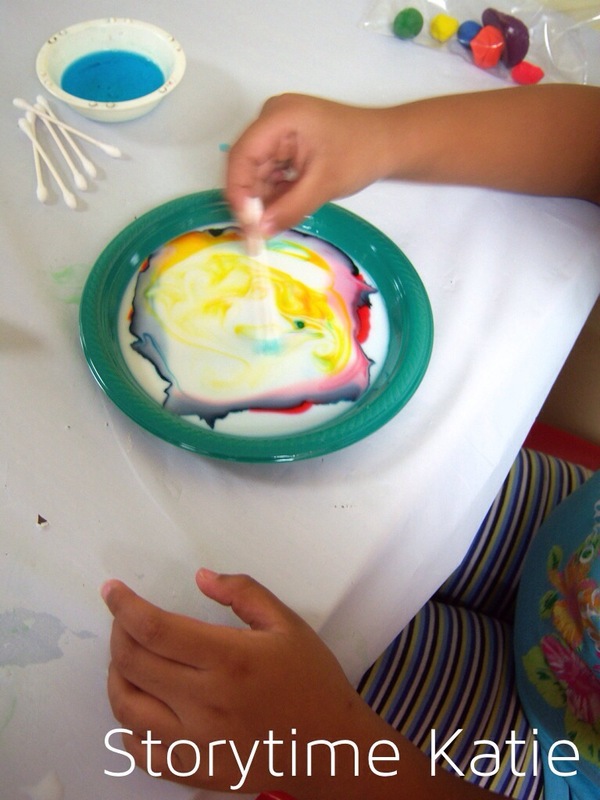 Using cornstarch and shaving cream, the kids made snow dough. I found out about this on Kendra. This is obviously a station full of mess, but another station that the kids thoroughly enjoyed. I had parents tell me that the dough lasted for a couple of plays after the program — I gave each kid a ziplock bag to take their dough home. 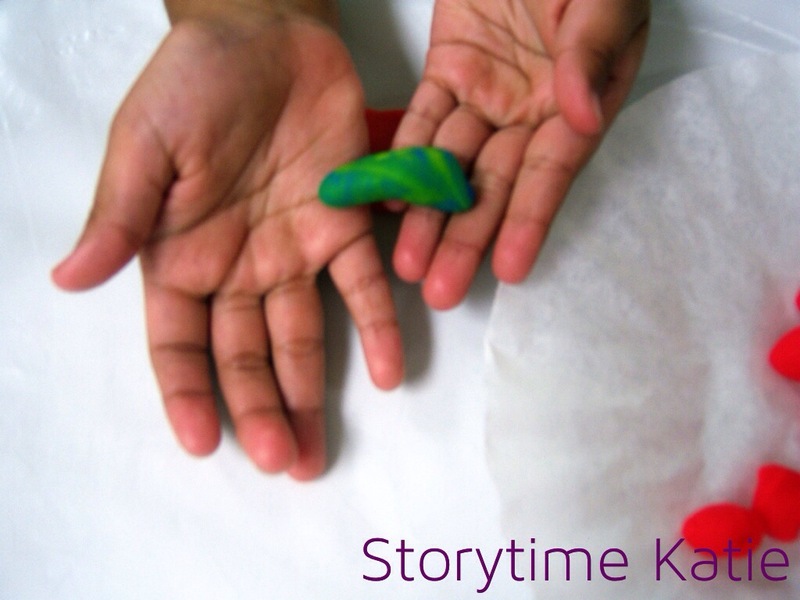 This was a great trial and error experiment for the kids. They had to figure out which ingredient they needed more of to make a consistent dough. I also took this station from Kendra. I put out a bunch of toothpicks, paper, glue, marshmallows, cotton balls, etc. and let the kids build their own snowmen. I spent a good deal of time during the introduction of the stations to remind parents that these were crafting marshmallows and that they were not meant for eating! I had a few kids that didn’t want to get their hands messy, so this station was a lot better for them. This was a flannelboard made by a predecessor. It has a little spinner and tells the kids what parts to add to the snowman. We played it as a group during the storytime session and I left it out during the station activities. Honestly, I so didn’t need it! The kids were more than happy to keep rotating between the first three stations. And my handouts: which included an activity page, booklist, and a coloring page. This is my official last Explore the World post! I did this last winter before I left my old library. I just felt like holding off the post until it was actual winter again. And a Pinterest friendly image! At this station, I challenged the kids to be able to get the scale to balance using different materials. One of my kids spent the whole time here, playing with popsicle sticks and pipe cleaners and various other supplies, creating a balanced scaled over and over again. Kids can challenge one another to build the highest tower using no more than twenty blocks. Since it was mostly preschoolers at this event, I found that a lot of them just stacked the same sized blocks one on top of another instead of hunting for bigger blocks or creating a base or anything. So, it was a meh station in my opinion since it didn’t accomplish what I wanted it to — but they love Legos! At this station, kids measured themselves on the wall with the help of a parent or librarian to see how they measured up to animals. I was totally inspired by our local zoo — they have tons of interactive displays where kids can see how they measure up to animals. I didn’t get quite as creative as Brookfield, I just put an animal picture bar on the side and marked where the animals would be. The kids walked around the programming room, introducing themselves to other kids: “I’m baby dolphin sized!” This was by far my favorite station. I really wanted an art station that required the kids to do the measuring to create. I found this amazing rainbow craft at Free Kids Crafts and knew that this is what we’d be doing. The kids measured and cut each strip (you can see my example strips in the picture), put them in order and stapled each end. As always, I had a book display and a take-home packet for my families. I also let them take home the measuring tapes that I had left-over since my plan was just to recycle the extras. I shared just a few books today about magnets. 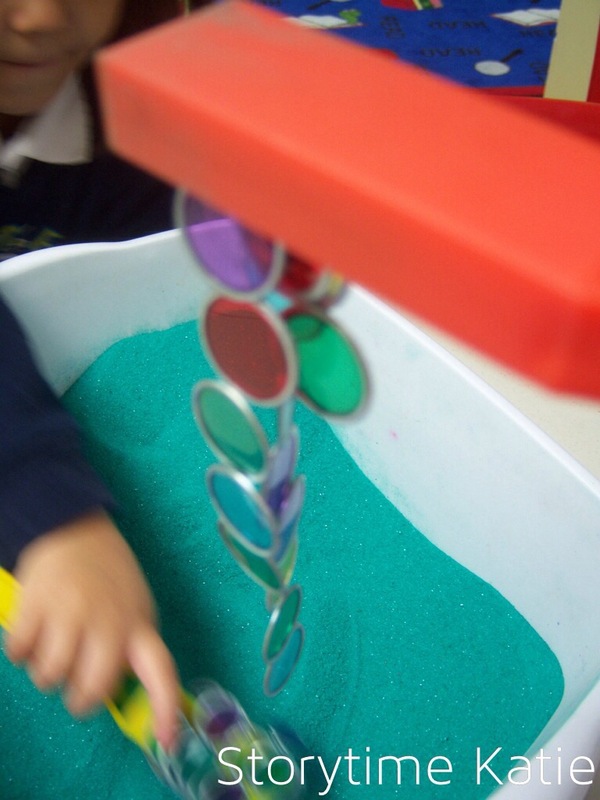 I think the best thing that I did was use two magnets for a demonstration where I invited each child up to feel the push and pull of the magnets. I also did a special magnet board with “Pete the Cat and His Four Groovy Buttons” which I got from Anne’s Library Life. While I did the story, I didn’t let the kids see what I was doing and once I had finished telling the story, I turned the board around and let them see the “magic”. Once we finished the group portion, it was time to move to the station activities. 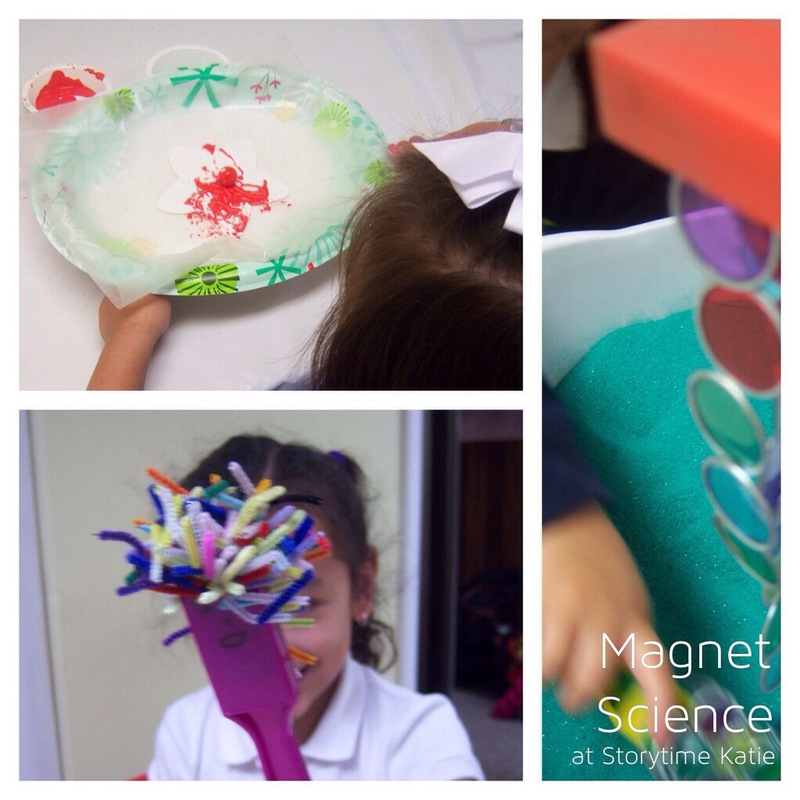 Before I run down the activity stations, I do want to highlight the products I did wind up purchasing for this program: Magnet Mania Science Kit & Super Magnet Classroom Lab Kit. There are our dishpans again, ha! I buried all of counting chips in some sand from our sand art surplus. The kids used the magnet wands to uncover buried treasure. They also had a great time chaining their counting chips and trying to build the longest chain of chips. I overheard some great conversations about why the chips had magnetic properties when touching the magnet wands from some of the parents! 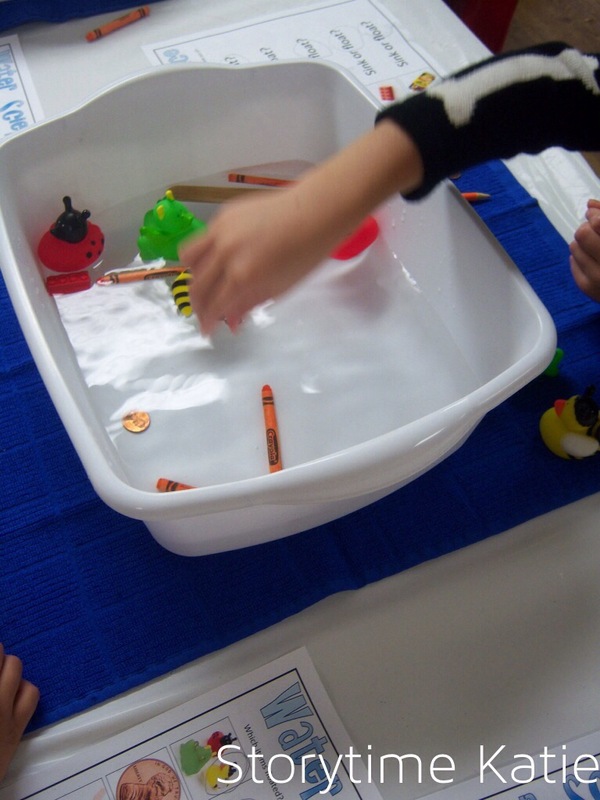 I used our Lakeshore Learning set and just let the kids go to town fishing for letters. What I really enjoyed were the interactions and cooperative play that I saw with the kids as they worked together to find the letters to spell their names. The biggest undertaking I’ve ever done before. I actually had two of our pages come downstairs with me specifically to supervise this station. 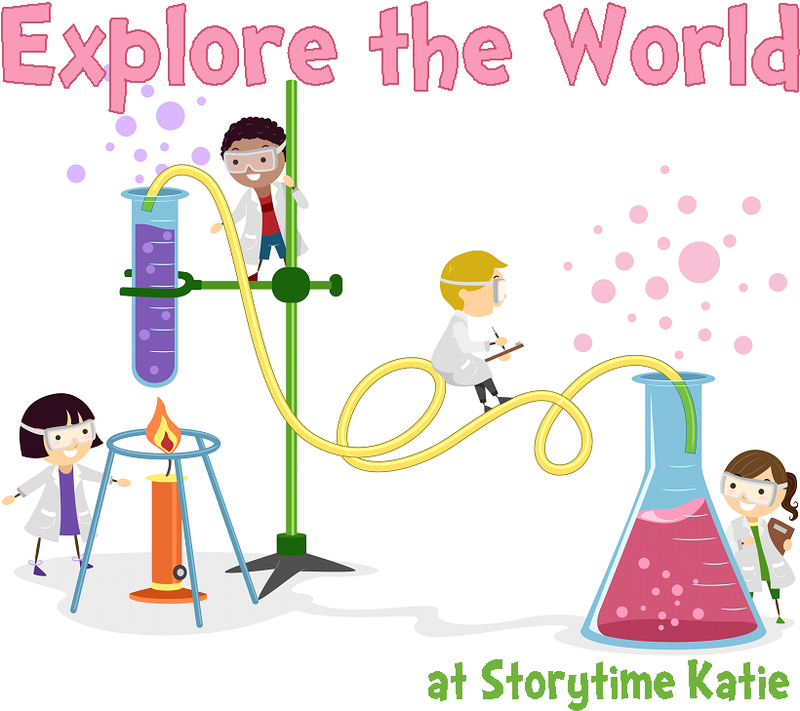 I found out all the instructions for this program at Let’s Explore, via Abby the Librarian. Our set-up involved large oval paper plates and some recycled tape rolls to prop them up. 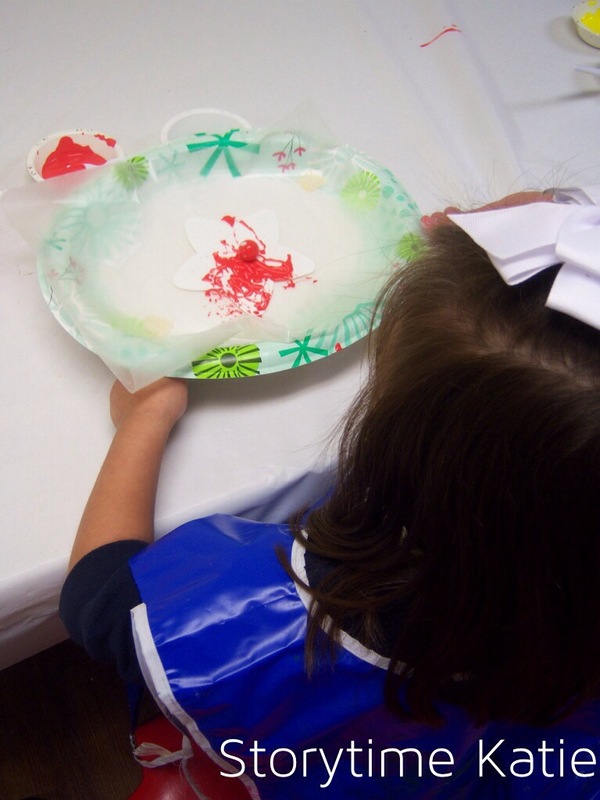 To make this an easier station, I pre-cut wax paper sheets that the kids could keep their shapes on and so the pages could easily re-set each paint station for another kid quickly without too much mess. This was an easy station — I put out all the extra magnets and supplies from the kits and let the kids play. I had quite a few kids that were fascinated with the pull/push aspects and spent a lot of time reversing the polarities to push magnets around the table. This station came from Abby at Abby the Librarian and I just absolutely loved it from the very beginning. It was probably the station that I was most looking forward to! Luckily, the kids loved it too. 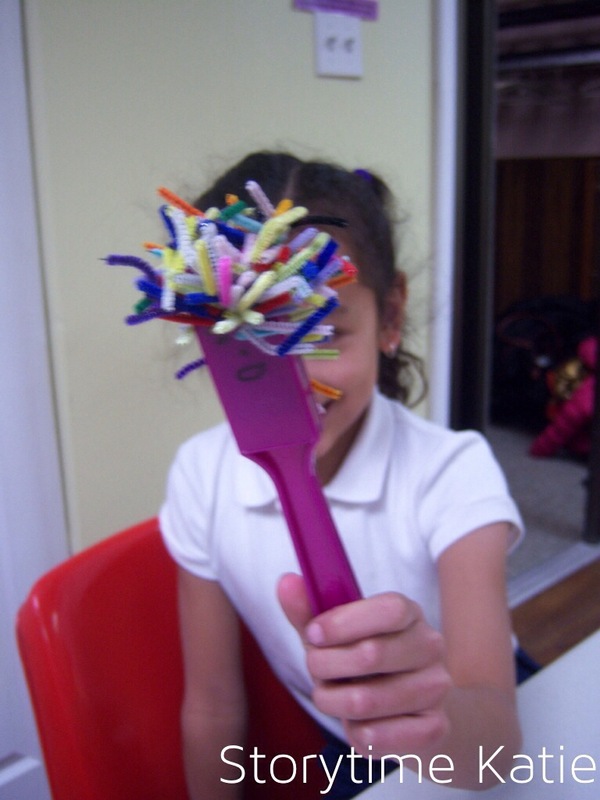 I have a lot of great pictures with their smiling faces and their magnet crazy hair creations. Super simple to cut up some pipe cleaners — I did use the skinny ones, with less fuzz. This is absolutely the station that kids kept coming back to over and over again for one last crazy hair creation! Since there are not a ton of books for the preschool age on magnets and magnetism, I did skip the display this time around. Instead, I handed out small baggies with supplies to test magnetism at home. I also handed out these take-home packets as they left. Inside there’s an activity page and a coloring page. Feel free to pin whatever pictures you want, but I did make another Pinterest friendly collage! 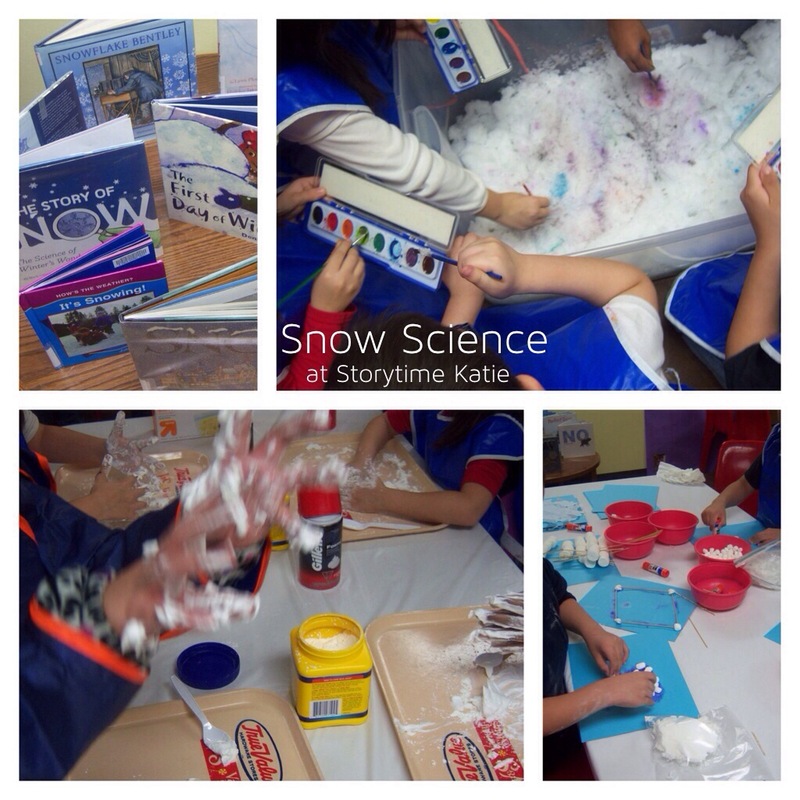 Coming soon…Size Science and Snow Science! I started off with “All the Water In the World” since it explains the water cycle in a fun, easy, approachable manner. Then I segued into the kids naming places that had water and I wrote them down on a piece of butcher block paper. I pulled out the different ocean animal flannelboards from the summer of 2010 and after doing the “Five Big Whales” flannelboard, I did some math problems with the animals and the kids. 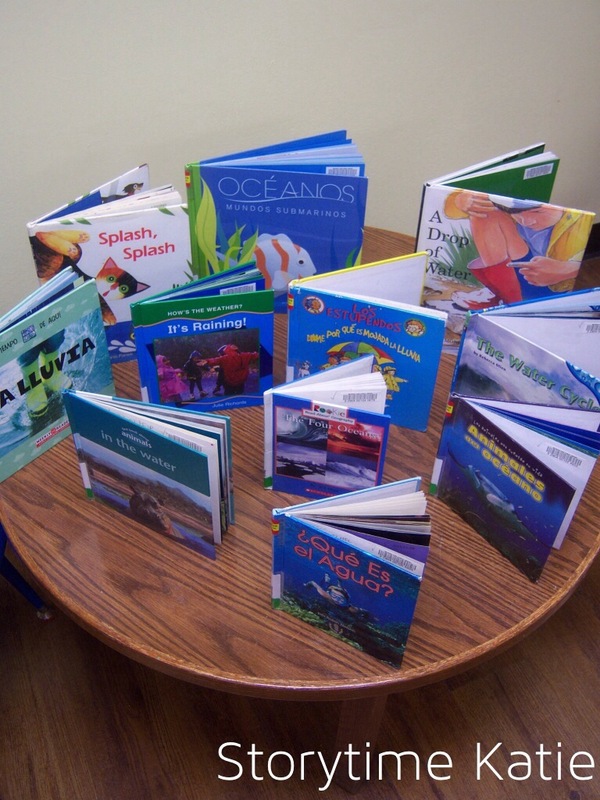 Then we read the last two books and talked about the rain and the different animals that live in the ocean. I got this amazing idea from Amy’s post on the ALSC blog. I filled up our two dish pans with water and had five items (rubber duck, penny, popsicle stick, Lego, and crayon) out for the kids to toss into the water. This is the station that had the best discussions, in my opinion. Lots of caregivers talking about what the objects were made of and why metal sinks and wood floats. The most interesting thing for the kids were the crayons which floated if you dropped them in gently and sank if you plopped them in. I got this idea from Hands On As We Grow. I raided the library’s cabinets of craft materials to sink what we dissolve. In the closets, we had sugar, flour, sprinkles, oatmeal, glitter, and drink mix. The kids loved stirring up their concoctions and I saw several of them stirring frantically trying to get the sprinkles to dissolve. We had some leftover color diffusing craft kits from a previous summer reading event in our closets. I know that we got them from S&S Worldwide, but they are no longer available. If you’re doing this program on the cheap, you can also use coffee filters! 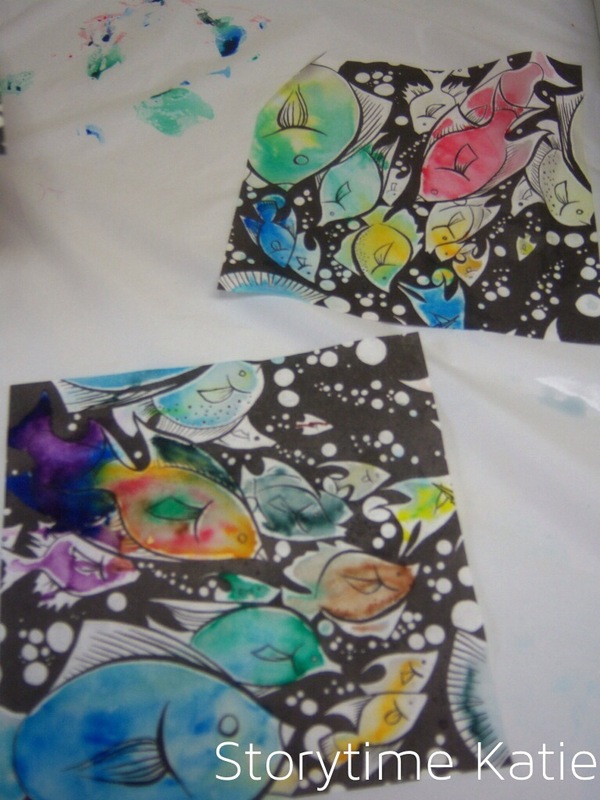 Kids colored with markers and then used a spray bottle to spread the color. They had a great time with this, and always love taking crafts home. This was be far the messiest station. I had an ice cube for each child. On the top were bowls with warm water, cold water, and salt. And I also had a ton of paper towels. The kids were encouraged to try and melt their ice cubes with the different bowl items. 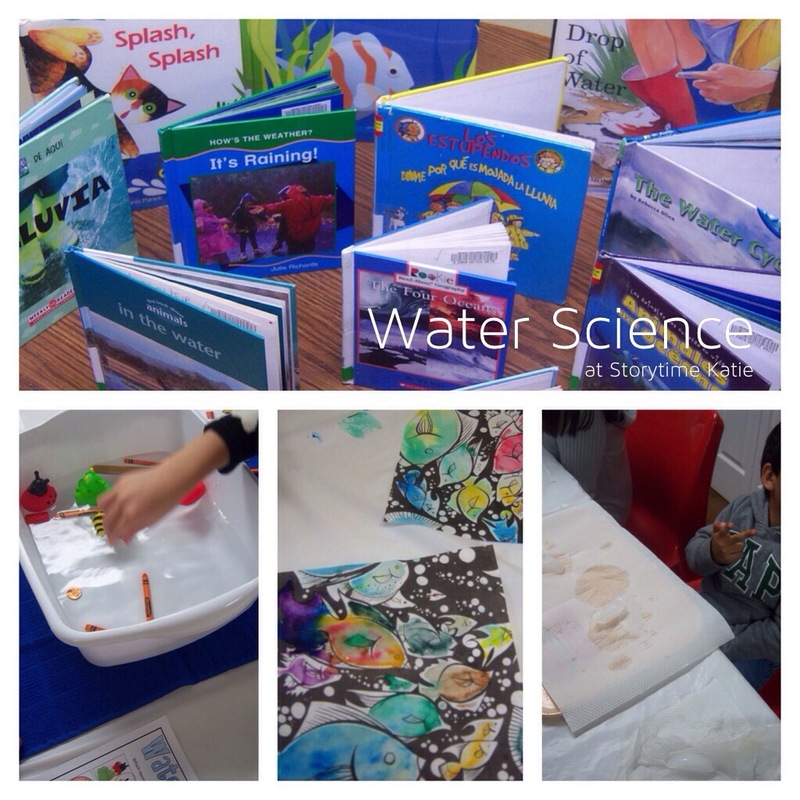 Lots of discovery about the effects of salt & warm water! I also handed out these take-home packets as they left. Inside, there’s a booklist, an activity, and a coloring page. (They love coloring pages!) I grouped the sheets of “Sink of Float?” in this packet in case you all wanted to see that too. And, here’s a super Pinnable image for you, if you’ve made it this far! I still have three more science programs to write up; keep your eyes out for them!